Many pop and rock bands have visited Exeter since the 1950's. Through the 60's the ABC was the main venue, followed by the Odeon. Towards the end of the 60's the University, St George's Hall and the Civic Hall, before it closed, were visited by the likes of the Who and Pink Floyd. The smaller Quay Club also started to attract bands, with David Bowie playing there in 1969. The Beatles and the Rolling Stones were the biggest of the early bands to visit Exeter, with thousands of teenage girls (and a few blokes) beseiging the cinemas, held back by burly policemen and 'strong arm' security. The Express and Echo always reported these shows, as much for the scenes of screaming teenages, as for the music. Later concerts by bands such as The Who didn't get a mention, as Beatlemania behaviour died down. It was all a bit cooler and flowery from '67 onwards. It is interesting to note that the Led Zeppelin gig was one of their first as Zep, and they were billed as Led Zeppelin, ex Yardbirds. The rest of this article is gleaned from the Express and Echo, and individual memories that I have received by email. The ABC was the venue for many pop acts during the 1950s and 1960s. One of the best remembered is the three shows given by the Beatles at the height of Beatlemania. The first show was when they appeared supporting Tommy Roe and Chris Montez on the 28th March 1963, when they performed Love Me Do, Do You Want to Know A Secret, Please, Please Me, I Saw Her Standing There and Taste of Honey, only five songs as a supporting act. Part of this show was recorded for BBC 2's 'On the Scene'. "In 1963 I went to the Savoy Cinema to see the The Beatles live on stage - jelly babies were everywhere. This was at the beginning of their fabulous career, you couldn't read a paper, magazine or turn on the television without the Beatles being mentioned............The following day after the concert whilst at work I was told that the Beatles were just leaving the Rougemont Hotel where they were staying - I immediately ran to the Rougemont Hotel where the Fab Four were just walking though the front of the hotel and I literally bumped into them. I stood there and just looked at their haircuts and the customised dark clothing. It made quite an impression." Another fan remembered the Beatles dropping into a record store opposite the ABC in London Inn Square at the time of the same show. Paul McCartney asked the fan if the store stocked their first LP, Please Please Me, that had only just been released. The fan grabbed a paper bag for the Beatles to autograph. The bag came up for auction in 2006 with an estimated price of £3,000. The next Beatles show in Exeter was on the 14th November 1963, after their popularity had spread, and 2,000 rampant boys and screaming girls welcomed them onto the stage of the ABC, while another 2,000 fans waited outside for the second performance. 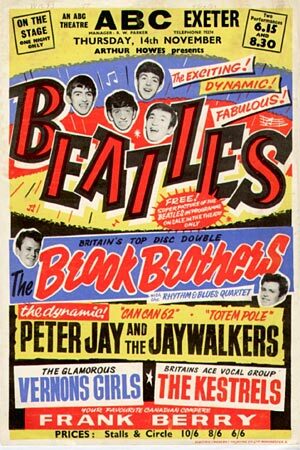 The show was compered by the comic, Frank Berry, who said "And here they are, John, Paul ..." to be drowned out by a decibel breaking ocean of screams. The jelly babies were in full flow that night, and a hail of the soft sweets hit the stage, much to George's disgust. A young John Pope was quoted in the Express and Echo as saying "As I watched them perform, I just had the hunch that I was watching history unfold and that this group were rather special, to say the least. I was only 13 years old then, but more than 40 years on, the magic of that evening still holds fond memories for me and I was glad to be a part of it." The next show of the 28th October was sold out 8 weeks before. On the way to the ABC for the 8 o'clock show, the Beatles transport got lost, causing them to miss the meeting at Honiton with a decoy van, and arrive for the show with only minutes to go. Ringo was asked what had happened and he remarked that the driver had taken the wrong turning down a lane (this was before the M5 motorway) but that they had found a 'very nice fish and chip shop'. They went on the stage to face a theatre full of screaming fans. The BBC interviewed the boys at Plymouth the next night - in the interview, Ringo explained why they were late for the Exeter, ABC show. Ann Moore a young fan at the time recalled: "I cried all the way through. Someone put their arm around me and didn't know who it was. We couldn't really hear the music because of all the screaming." "I remember as a 6 year old being on a bus going to Countess Wear having to crawl past crowds outside the ABC after the Beatles had played there. The bus was full of excited girls, some crying. Quite strange and confusing for a 6 year old." Cream University – 13th December 1966. The Rolling Stones played at Exeter three times in the 1960's. The first time was on the 26th August 1964, when they gave two shows at the ABC. They returned to Exeter on 2nd October the same year, to play another two shows at the Odeon. The Odeon had missed out on touring pop acts up until then, with most playing at the ABC. The Stones were the first to play the Odeon after they had new dressing rooms built. The third time the Stones played Exeter, was also at the Odeon on the 16th July 1965. This was the first date of a series of Summer appearances with two shows in Exeter. Other groups on the bill that day included the Walker Brothers and Rod Stewart! "Ambulance men and police were on duty, but only one girl was reported to have fainted. But a coathanger and hat were taken from a van belonging to the Barron Knights, another group in the show. The items were found on two girls by a police constable and were smeared with lipstick." "The fans howled and screamed, surrounded the building, tried to enter the dressing-rooms (just built at a cost of £6,000), and were kept at bay by a strong police contingent, plus 20 strong-arm men who lined the front of the stage as 'The Stones' went into their act." Cliff Richard played the ABC on 18th November 1964, the same night that Dusty Springfield appeared at the Odeon, making the night the first time that a film could not be seen in Exeter since the blitz. The report on the Cliff Richard show came some months after the Beatles and the Stones had played in the city. The reporter, Frank Jarvis didn't all together approve of the 'guitar' groups, and his write up on the well established Cliff Richard reflects this. He wrote that Cliff and the Shadows were an 'infinitely polished act' and 'were a welcome relief from the seemingly endless successon of current 'pop' groups'. He went on 'what a change it was from the eternal twanging guitars'. Frank Berry and Faye Fisher were the support acts that night, while the Johnny Hawkings Orchestra supplied the backing. The Yardbirds evolved into Led Zeppelin in 1968. One of their early gigs was at Exeter's Civic Hall on 19th December 1968, for a fee of £125, when they were billed as Led Zeppelin ex-Yardbirds. Their gig is remembered by Mick Farrant of the Deviants, in this piece from the Perfect Sound Forever website. "We opened for Led Zeppelin a couple of times when they were very first starting. They still had to put ex-Yardbirds underneath Led Zeppelin. We played the Exeter town hall, and all those farm boys showed up. Some girls were watching us at the front, and the farm boys marched the front and said, 'why you watching them faggots.' You have to remember, back in those days, once you got out of the major cities, long hair and velvet and all the rest of it was... you were immediately prejudged homosexual and treated accordingly. Which sometimes would amount to something close to lynching. So these fistfights started and the cops came, and we scurried back into the dressing room after beating our way off the stage, the roadies sort of fighting a rear guard. Physically fighting any people with microphone stands, and Plant and Page are laughing their heads off, going, 'god, you must have been awful.' And they went on to exactly the same reception." A flyer for a show in December 1965. Manfred Mann and the Yardbirds were noted for playing the blues. Eric Clapton had been with the Yardbirds but left in March 1965, when he joined John Mayall's Bluesbreakers, and later formed 'supergroup' Cream. The Yardbirds later evolved into Led Zeppelin. Flyer courtesy of Paul. Come on you green haired, Mohican shorn Punks - how about some memories from your era. And what about Exeter's Bay City Rollers fans?...dare you admit it! Contact me here.